A US jury on Tuesday acquitted a Peruvian former soccer boss at the FIFA corruption trial in New York, just days after convicting two South American co-defendants. The panel found 60-year-old Manuel Burga, who led football in Peru until 2014 and once served as a FIFA development committee member, not guilty on one count of racketeering conspiracy, a spokesperson for the US Attorney’s office in Brooklyn confirmed. They returned the verdict on the seventh day of deliberations. Jurors on Friday convicted Jose Maria Marin, former head of Brazil’s Football Confederation and Juan Angel Napout, former head of Paraguayan football. But they told Judge Pamela Chen last week that they were deadlocked on Burga, following a seven-week trial that exposed systemic corruption at the heart of the world’s most popular sport. They subsequently returned after the Christmas holiday to resume deliberations on Tuesday. US prosecutors told the trial that Burga agreed to receive bribes but never received them because he was under investigation at home in Peru for money laundering. His acquittal comes more than two and a half years after the United States unveiled the largest graft scandal in the history of world soccer. Marin, 85, and Napout, 59, were immediately remanded into custody on Friday. Under federal guidelines, each faces at least 10 years in prison. Convicted on multiple counts, each count carries a maximum sentence of 20 years. US prosecutors indicted 42 officials and marketing executives, as well as the sports company Traffic, and detailed 92 alleged crimes to the tune of more than $200 million, but so far only these three defendants have faced trial. Of the individuals indicted, 24 have pleaded guilty — two of whom have already been sentenced by Chen. Fifteen remain in their own countries, including Brazilian football confederation president Marco Polo Del Nero, who was earlier this month banned from soccer for 90 days as part of FIFA’s own investigation into corruption. 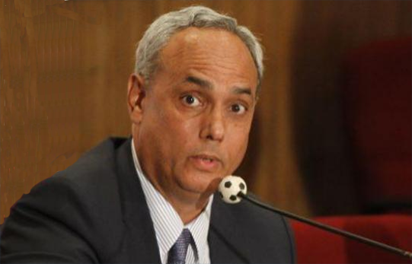 The post FIFA trial: New York jury acquits former Peru soccer boss appeared first on Vanguard News.